AESS Chair, Sarah Leonard welcomed the audience and Courtney Kenny was in attendance. He emphasied the need for clear communication with the imaginative use of text through exemplorary diction in both the sung and spoken word. 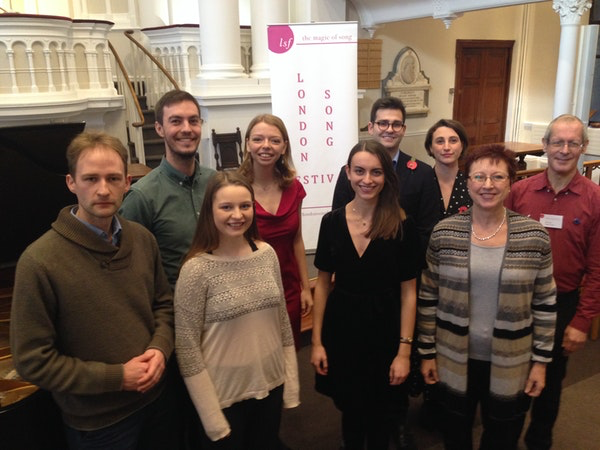 Five singers and pianists performed themed recitals of their own devising. The judges, Carolyn Richards, Gavin Roberts and Richard Suart, were impressed by the standard of the performances and the imagination used in devising the programmes. Written feedback will be sent to all the singers of the preliminary round and the final to help them develop their skills and artistry. The AESS wishes to thank the judges for both the final and the preliminary rounds, the Headteacher, Marie Wallace and the staff of Tonbridge School, and Michael and Judith Hildesley who loaned the use of their studio facilities at Tagg’s Yard. The AESS is extremely grateful to Courtney Kenny for his generosity in sponsoring this award. This entry was posted in Past Events on March 12, 2019 by AESS. A full house waited in anticipation for the second AESS Competitions Prize-Winners Concert which is now held as part of the London Song Festival. The AESS is grateful to artistic director,Nigel Foster, for hosting this showcase for the excellent performances which were enjoyed by an enthusiastic audience. The theme of the hour-long concert was Conflict in all it Forms and included the first and second prize winning songs from the recent Song Composition Competition. 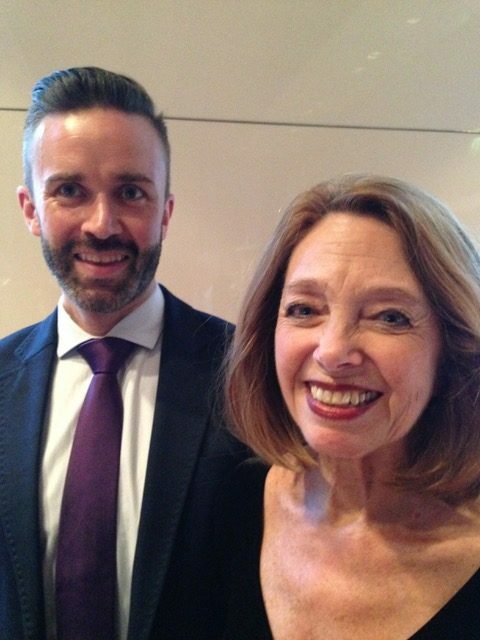 The concert included a wide-ranging repertoire of English song from the 18th to the 21st centuries. In spite of the seriousness of the theme, there was a great variety of emotional responses to the texts, from Gurney and Harvey’s In Flanders, via Britten and Auden’s Johnny, to Dring and Shakespeare’s Take o take those lips away. Nicole Johnson proved to be a sympathetic, stylish and technically assured colleague for the four singers who all gave heartfelt and engaging performances with varied tonal expression of songs performed from memory. Particularly memorable in the opening group was Emily Gray’s performance of In Flanders, marrying text and meaning, and shaping melody to produce a moving feeling of home sickness with a wonderful sense of stillness. Ailsa McTernanbrought a bright, fresh sound with excellent diction to the text of Everyone Sang with a plangent sincerity that brought alive the sense of hope in the poem. Lila Chrisp’s real emotional commitment to text and a sense of urgency in her delivery, as well as a sense of fun, created well delineated vocal portraits of varied material. In two world premier performances, Florian Panzieri gave smooth toned, considered and deeply felt performances of the new songs by Tim Ravalde and Robert Crehan. Crehan employed spare textures for Owen’s Anthem for Doomed Youth with a thumping ostinato pulse which gave way to almost plainsong like unaccompanied vocal melisma. In the winning song of the composition competition, Ravalde used an aching rolling piano scheme with rhythmic martial punctuation in Sassoon’s Dreamers, the vocal line well suggesting the multi-faceted and fractured life of existence in the trenches. This was a really excellent showcase for the aims of the AESS. Chairman, Sarah Leonard said it was very important to keep the tradition of creating new English Song alive and the occasional song composition competition was one way of achieving this. 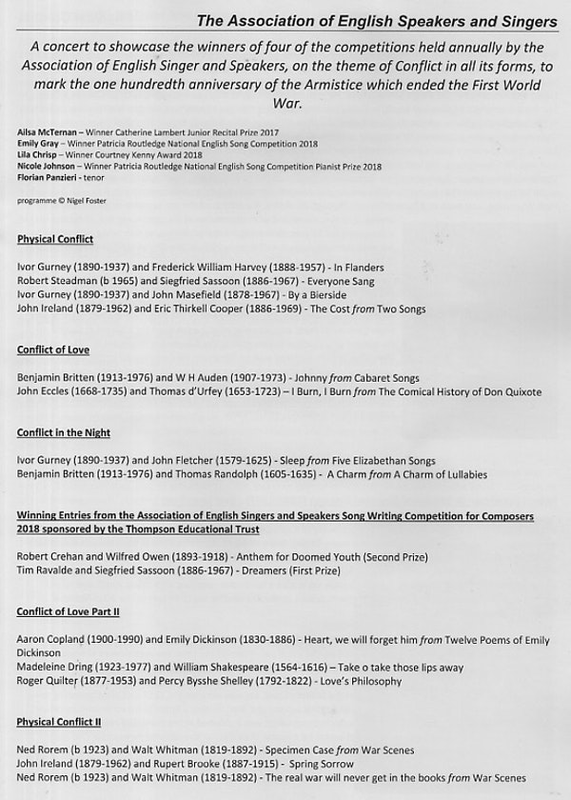 The previous winners in the first competition had been published in the latter volumes of A Century of English Song and it is to be hoped that possible further volumes will include the new additions to the genre. The AESS is grateful to The Thompson Educational Trust for its support of the Song Composition Competition. The final took place in the Carole Nash Hall at Chetham’s School of Music, Manchester on Saturday November 17th. The hall is a stunning venue, with a glorious Bosendorfer piano and all our singers and pianists rose to the occasion. We are very grateful to Chetham’s School for letting us use this wonderful space. The judges were Jonathan Courage and Sarah Leonard. Due to the Northern Trains rail strike, our third judge, Eiddwen Harrhy was not able to be with us. There were seven young singers aged between 14 – 17 in the finals. The prizes were awarded in the following order. Jonathan Courage read a letter from Catherine Lambert wishing all the singers luck in the future and encouraging them really to understand and enjoy the words in prose and song. The co-ordinator is Carolyn Richards. Our thanks to her. A record number of entrants was heard in a preliminary round and six singers and their pianists were put through to the final. The requirements of the competition are that entrants perform from memory an integrated themed recital not exceeding twenty minutes, using art songs, prose, poetry, and also their own words, all using original English texts. Susan Bullock CBE, and the first winner of the Senior Prize, spoke on behalf of the judges about what they were looking for in making the awards. She talked about the need for clarity and honesty of expression, the use of colours in the voice and the marrying of them with spoken text and song, so that it was almost impossible to differentiate between which was which. Dame Patricia Routledge also spoke of her admiration for the artistry of such promising young performers and urged them to continue their journey with the English language. The AESS wishes to thank the Director and staff of Trinity Laban Conservatoire of Music & Dance for the loaning of their facilities. This entry was posted in Past Events on June 29, 2018 by AESS. After the AGM, entertainment was provided by Sarah Leonard, Nicola Harrison and Patricia Williams in a programme entitled From Dawn Till Dusk. The encore of The Owl & the Pussycat was written by Michael Pilkington for Patricia Routledge to sing in a production of Goldilocks and the Three Bears in 1955! 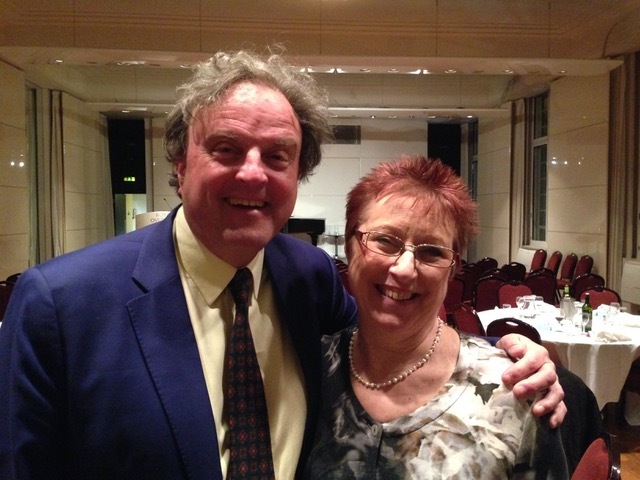 Chairman, Sarah Leonard, introduced Honorary President, Dame Patricia as the guest speaker. Dame Patricia’s theme was of mentors who had influenced her life and guided her. She talked about how we all had such mentors in our lives and that we, no doubt, were mentoring the next generation. Once again, the annual dinner was a chance to meet up with old friends and colleagues and to make new acquaintances. Dame Patricia Routledge with Catherine Lambert. Catherine will celebrate her 100th birthday on November 25th. 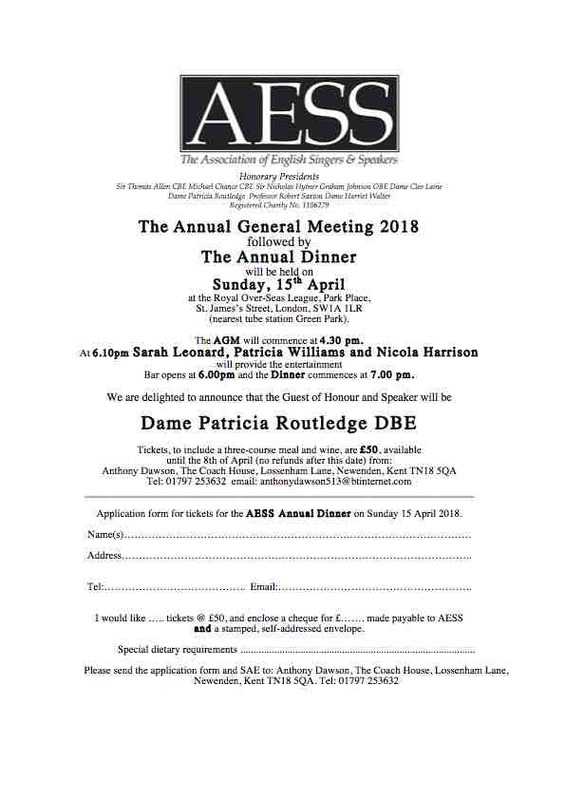 For information on Catherine and her long association with the AESS, visit: Catherine Lambert – a story in photographs (by permission of Catherine Lambert, Norbert Meyn and Janis Kelly) and The Founding of the AESS by Catherine Lambert. This entry was posted in Past Events on May 23, 2018 by AESS. Ten young actors performed themed programmes of their own devising, lasting no more than seven minutes. Several acting schools from around the country were represented. John & Julia Dewhurst sponsor the second and third prizes and the AESS is grateful to the generosity of all the sponsors of this worthwhile competition. The AESS is grateful to the principal and staff of the Royal Central School of Speech & Drama for hosting the event. Thanks also to the judges. This entry was posted in Past Events on April 22, 2018 by AESS. This entry was posted in Past Events on April 9, 2018 by AESS. This entry was posted in Past Events on January 15, 2018 by AESS.